Abstract base class for an SQL connection. 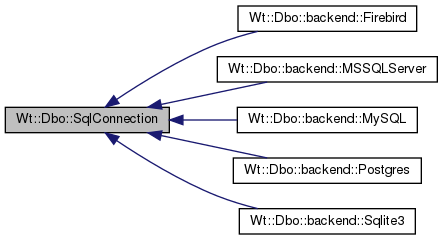 An sql connection manages a single connection to a database. It also manages a map of previously prepared statements indexed by id's. This class is part of Wt::Dbo's backend API, and should not be used directly. All methods will throw an exception if they could not be completed. Returns the command used in alter table .. drop constraint .. This method will return "constraint" by default. Default: ALTER TABLE .. DROP CONSTRAINT ..
Returns the SQL statement(s) required to create an id sequence. This is used by Session::createTables() to create the id sequence for a table. The table's name and primary key are passed as arguments to this function and can be used to construct an SQL sequence that is unique for the table. Implemented in Wt::Dbo::backend::Postgres, Wt::Dbo::backend::Sqlite3, Wt::Dbo::backend::MySQL, Wt::Dbo::backend::Firebird, and Wt::Dbo::backend::MSSQLServer. Returns the SQL statement(s) required to drop an id sequence. This is used by Session::dropTables() to drop the id sequence for a table. The table's name and primary key are passed as arguments to this function and can be used to construct an SQL sequence that is unique for the table. Returns the infix for an 'autoincrement' insert statement. This is inserted before the values part of the insert statement, since Microsoft SQL Server requires that the autoincrement id is returned with OUTPUT. Returns an empty string by default. Returns the suffix for an 'autoincrement' insert statement. This is appended to the insert statement, since some back-ends need to be indicated that they should return the autoincrement id. Returns the 'autoincrement' SQL type modifier. This is used by Session::createTables() to create the id column. Returns the 'autoincrement' SQL type. This method will return "boolean" by default. Reimplemented in Wt::Dbo::backend::Firebird, and Wt::Dbo::backend::MSSQLServer. Returns a new connection object that is configured like this object. This is used by connection pool implementations to create its connections. Implemented in Wt::Dbo::backend::Firebird, Wt::Dbo::backend::Sqlite3, Wt::Dbo::backend::MySQL, Wt::Dbo::backend::Postgres, and Wt::Dbo::backend::MSSQLServer. This function commits a transaction. This is a convenience method for preparing a statement, executing it, and deleting it. Reimplemented in Wt::Dbo::backend::Postgres, Wt::Dbo::backend::MySQL, and Wt::Dbo::backend::MSSQLServer. Executes a connection-stateful SQL statement. This executes a statement, but also remembers the statement for when the native connection would be closed and reopened during the lifetime of this connection object. Then the statements are redone on the newly opened connection. Such statements could be for example 'LISTEN' in a postgresql connection. These statements are only executed upon a reconnect for those backends that support automatic reconnect, but not when a connection is cloned. Returns the statement with the given id. Returns 0 if no such statement was already added. This will create a copy of the prepared statement if all instances are in use. Returns the 64-bit integer type. This method will return "bigint" by default. Execute code before dropping the tables. This method is called before calling Session::dropTables(). The default implementation is empty. Returns the property value, or an empty string if the property was not set. Returns the true if the database require subquery alias. This method will return false by default. This function rolls back a transaction. Saves a statement with the given id. Properties may tailor the backend behavior. Some properties are applicable to all backends, while some are backend specific. show-queries: when value is "true", queries are shown as they are executed. This function starts a transaction. Returns true if the backend support Alter Table. Reimplemented in Wt::Dbo::backend::Postgres, Wt::Dbo::backend::MySQL, Wt::Dbo::backend::Firebird, and Wt::Dbo::backend::MSSQLServer. Returns true if the backend supports "deferrable initially deferred" foreign key constraints. Reimplemented in Wt::Dbo::backend::Postgres, and Wt::Dbo::backend::Sqlite3. Returns true if the database supports Update Cascade. This method will return true by default. Was created for the oracle database which does not support Update Cascade. This is the text type for a string. If size = -1, then a type should be returned which does not require size information, otherwise a type should be returned that limits the size of the stored string to size. This method will return "text" by default if size = -1, and "varchar(size)" otherwise. Returns whether the SQL dialect uses 'ROWS ? TO ? ', limit or rownum for partial select results. This is an alternative SQL dialect option to the (non-standard) 'OFFSET ? LIMIT ?' syntax. The default implementation returns Limit.